Here are the details for the National Administrator of Keep Our NHS Public (KONP) role. KONP is looking to recruit a committed, enthusiastic administrator to keep the wheels running of the organisation at the forefront of fighting for our NHS. We are a small organisation with a big agenda and need a national administrator who is, friendly, positive and calm in dealing with urgent matters, prioritises tasks well and enjoys problem solving. 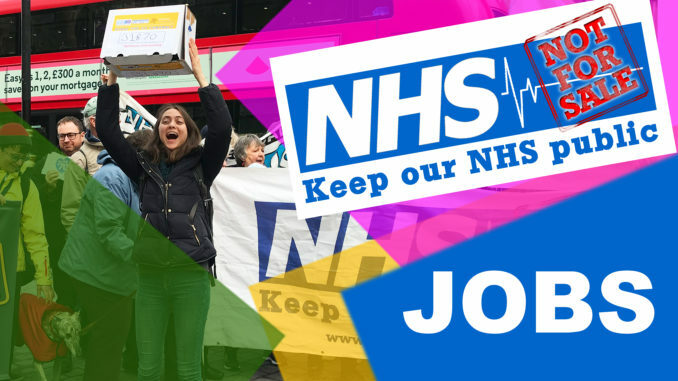 KONP is a campaigning organisation founded in 2005, whose aims are to resist NHS privatisation and oppose the damaging cuts that are destroying one of the most achievements of a progressive society; free universal high quality health care for all. Please take a look at the about us page before making an application. The post is part time, offering a minimum of 16 hours a week work at the rate of £15.50 per hour. All of the people who work for KONP work as contractors. If this is a problem, please discuss with us. Please read the Job Description here. We are looking for a dedicated, friendly and helpful personality who copes well with stress and maintains focus on the workload, and who has good interpersonal skills. Please submit your letter of application, addressing the post and person specs and include your CV. You can view and download the full Job Description here.